I WANT TO EAT THAT. There are plenty where these came! To see everything I pin all week long, follow me on Pinterest. One of my favorite books as a child, which I'm guessing was one of your favorites as well, was "If You Give a Mouse a Cookie." Essentially, the gist of the book is this little mouse in jean bib overalls pleads for a cookie, and once he gets it, he asks for a million other things and it all snowballs from that one simple desire for a singular cookie. In our case, Eric is the mouse, and knocking down walls in our house is the cookie. 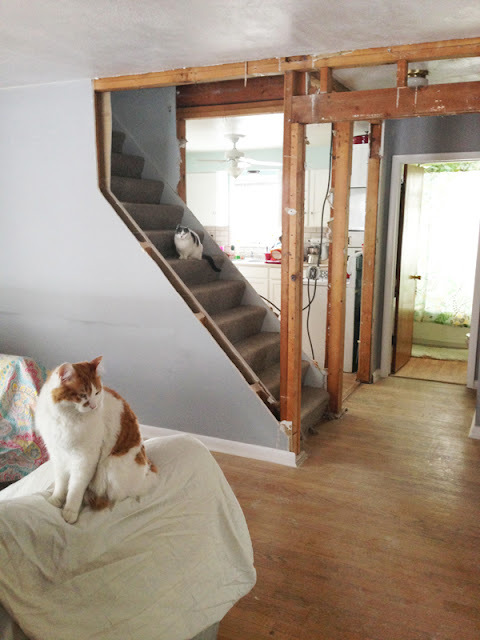 Last week I shared with you how we've removed a wall between our living and "French" rooms in the house (I suppose I can no longer call it the French room, because the French doors no longer live there. Henceforth, this space shall be known as the "dining area"). Before that wall has even been refinished, Eric got the idea in his head that we simply need to rid our house of more wall space. I've mentioned before that our house is just a little guy, and its floor plan is anything but "open." With such a small house, we've been wanting to open up the space as much as we can to make it feel larger, airier and brighter. One solution we thought of was partly opening the wall between our kitchen and living room. This is the wall in question. The only problem is, in the space behind that wall, we've got stairs that lead up to the second floor of our house. 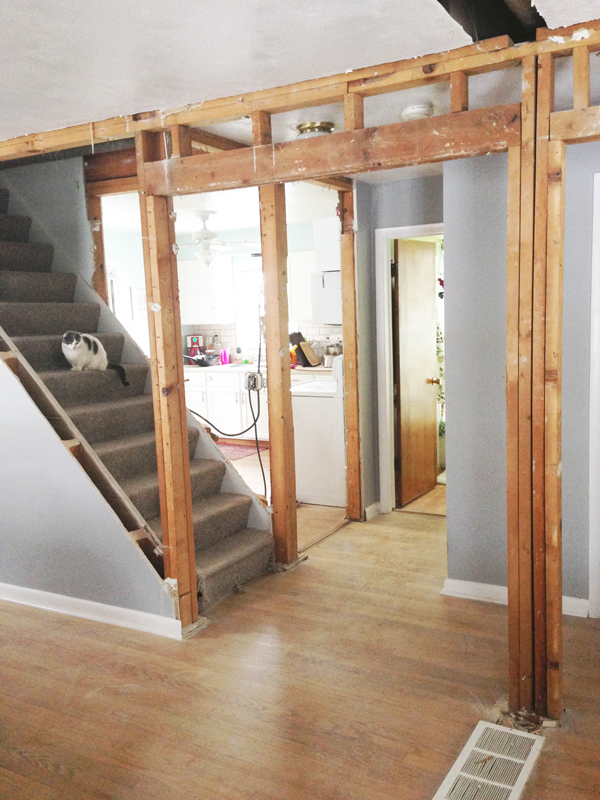 We can't remove the entire wall, but we thought if maybe we removed some of it, leaving the bottom half of the stairs exposed, it would definitely open up the space, especially because it would allow us to see from part of the kitchen into the living room. An essential in any open floor plan. Another reason we wanted to do this? From the first day we even thought of looking for a home to buy, over two years ago, Eric stressed his love of an exposed stairway with a bannister. He says it stems from his first house as a child, and he loved having that bannister in his home. Someplace to hang stockings and decorate and peer down to the floor below. At any house we looked at while home searching, if it had a bannister, it got bonus points in Eric's book. We thought we wouldn't tackle this project until we expand our second floor next summer. 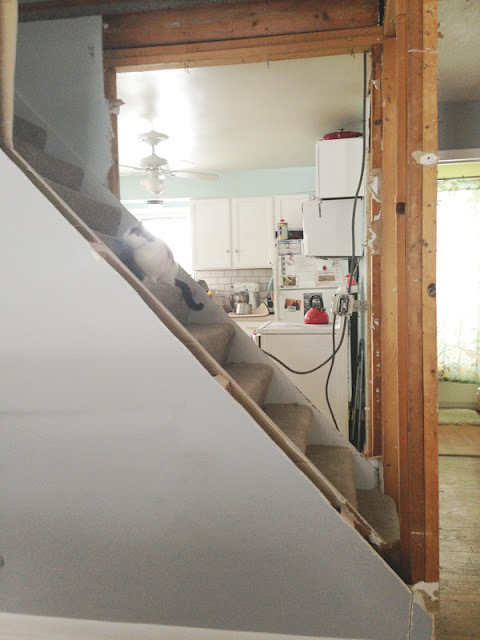 But because when Eric gets a home-renovation idea in his head, he just can't shake it until it's complete.... and also because we already had contractors removing walls in our home anyway.... we decided to bite the bullet and complete the job now. I know, we just can't be stopped. So yesterday our contractor, Jamie of JME Services, and his partner, came over to work on the wall you see above. I came home that evening and, as soon as I saw what was done, my jaw dropped.... in a good way. Try to look past all the horrible drywall dust, exposed studs and wiring..... like I said, this is all in the very beginning stages. But, holy cow what a difference! Just opening up that little space so that you can see through to the bright kitchen from the front door.... it makes the space feel twice as large. As you can see, the cats approve, as well. Lieu Lieu has already claimed territory over the stairs as her highest throne. And here's what it looks like if you're standing in the kitchen, looking to the front of the house. I know, it's in shambles, but use your imagination. The only thing I'm sad about is the removal of the portion of the wall in the kitchen where my chalkboard and shelf o' kitsch lived. I'll miss my cute little wall, but the openness of our house completely makes up for it. Besides, I'll find another place for my little trinkets elsewhere. So there you have it! Another almost on-a-whim renovation project in our house this month. I'm so excited to see the end results. I'm already so happy at the beginning stages, I can't imagine how great I'll feel once everything is all cleaned up and ready to go! For give me, blog readers, for I have sinned. It's been two months since my last confession blog post. Sorry about the major hiatus, friends. I didn't mean to leave you hanging, I just.... haven't had much to say. Life has been incredibly busy - I've got a new job and there is just over two months to go until the wedding. Needless to say, life has been one big whirlwind. On top of it all, I want this blog to keep offering relevant content. I refuse to post anything mindless just to put something out there. All too often I find myself reading other blogs and thinking to myself, "Why is this on the Internet?" I don't want this space to turn into something like that. So, as I feel I haven't had a ton of relevant information to share, I've kept quiet. And oooohhhhhh, friends, is this something relevant, indeed. You see, since the wedding planning has picked up, we really haven't made any major home changes. My focus has been on making wedding decorations, booking vendors and just trying not to stress out about the entire process. When you're planning on of the biggest events of your life, everything else tends to fall by the wayside. But Eric, on the other hand, has been itching to get a move on a few projects around the house. You see, a couple of months ago I planted the seed of the idea in his head that our little home would feel so much bigger if we took down the wall that separates the living room from the French room (the one with the French doors). By opening up the space, we could easily fit more people into our home while entertaining, and things just wouldn't feel so cramped. The wall with the French doors is the wall in question. Here is a photo of the wall with the French doors closed on the day we closed on our house. This picture is totally wild to me. So we sat on the idea for awhile, thinking we wouldn't tackle it for a while. The wall coming down was all Eric would talk about for weeks. He just kept getting more obsessed.... until finally he contacted a contractor to come take a look and see if the wall could come down. The contractor came. He confirmed the wall could be taken down. Eric's eyes lit up. The very next day, demolition began. 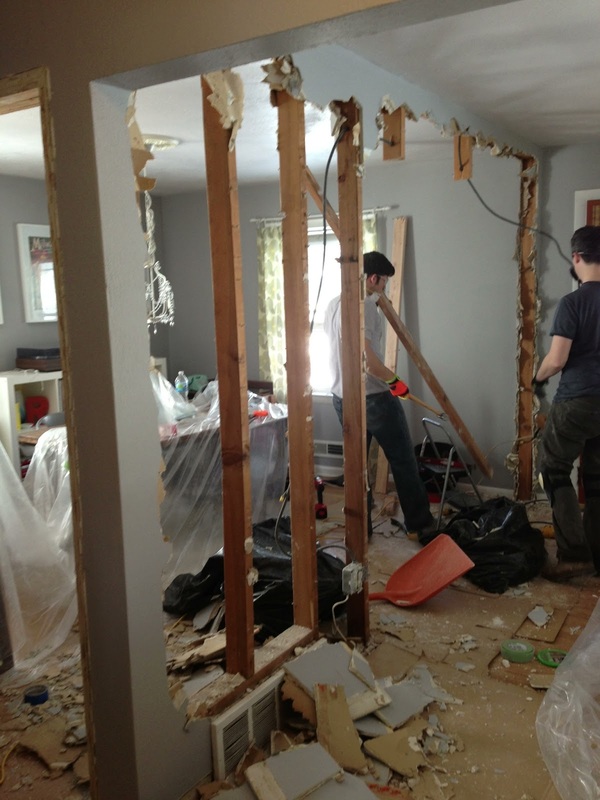 In order to attempt to keep costs down, we agreed that we would handle most of the demolition and Jamie, our contractor, would finish it up with his professional skillz. We started with taking down the French doors (which we will miss, because they're pretty, but we're keeping them to use in a major project we're tackling next year). Then Eric began to take down the trim. Did you notice the wall with my favorite gallery wall has to be taken down? While I adore that gallery wall, I know I'll love how open our home feels once it's down. Besides, I've got an idea about where I'll give it new life once renovation is complete. Before the real demo began, things needed to be taped off. Two huge sheets of plastic were taped up on either side of the wall in an attempt to keep the rest of our house as clean and debris-free as possible. Once everything was prepared, it was time for destruction. Let's just say after watching hours of HGTV home renovation shows, Eric was more than ready to get down to the demo work. With protective eyewear, a mask and gloves, it was time to get down to business. This guy was in heaven. The boys went to work for hours, sledgehammers flying. While I did my best to stay out of the mess, I'd pop in every now and then to check on the progress. It's amazing how much they were able to rip down in a matter of hours! Eventually, all the wall studs were taken down and we were left with a huge, gaping hole, the air return and the larger column on the left. Them boys did good, they did. So, as you can see above, there's still some clean-up work to be done. That's where our contractor, Jamie, comes in. Because we have taken care of most of the demo, we're getting a great deal on the rest of the renovation. Putting in a little of your own elbow grease definitely pays off! Jamie will be removing the column you see above, removing the studs and beam from the ceiling, and filling in the missing floor boards so our hardwood floor looks relatively seamless after the repair. I'll be sure to fill you in on the finished project once Jamie as worked his magic! It's still incredible to me that we're actually getting a major project done just a couple of months before the wedding. While I'm still getting used to all the openness of the space, it's going to be invaluable as we have more gatherings at our house. While the design of our home allows for very little open space, this is going to help make what we've got feel bigger, easier to breathe in and help the flow of everything just a little bit more. I can't wait to share the finished product with you! Stay tuned! Owned & operated by Rachel. Simple theme. Powered by Blogger.